The Propella golf team has successfully defended the trophy won in 2008 for the Pupuke Golf Club's 'back-to-front' day. This tournament is played backwards so you tee-off from near the 18th green and have to negotiate trees and gullys backwards around the course. If you know the Pupuke course try playing from the eighth Tee to the sixth green or from the second green to the first green sight unseen. 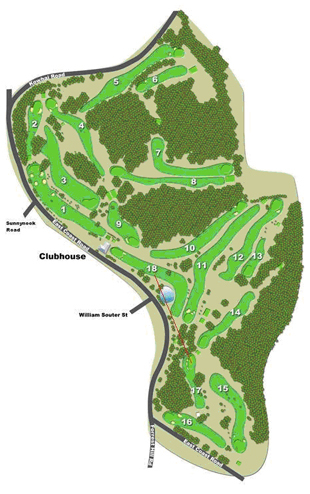 The course diagram shows the path in red from the 18th to the 17th. We (i.e. Bruce) drove through the trees and took a full bounce over a bunker to land twenty feet from the pin. A good putt provided the Eagle. All work and no play does not a Propella Head make.